Bald men in Mozambique could be targets of ritual attacks, police have warned, after the recent killing of five men for their body parts. Two suspects have been arrested in the central district of Milange, where the killings occurred. "The belief is that the head of a bald man contains gold," said Afonso Dias, a police commander in Mozambique's central Zambezia province. Albino people have also been killed in the region for ritual purposes. Three men have been killed in the past week alone. 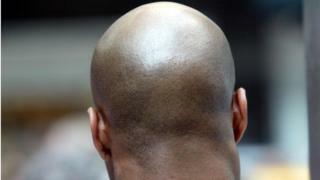 The BBC's Jose Tembe in the capital, Maputo, says police think the notion of a bald head containing gold is a ruse by witchdoctors to get clients to take a person's head to them. "Their motive comes from superstition and culture - the local community thinks bald individuals are rich," Commander Dias is reported as having told a press conference in Maputo. The suspects are two young Mozambicans aged around 20, the AFP news agency reports. A regional security spokesman, Miguel Caetano, told AFP that one of the victims had his head cut off and his organs removed. The organs were to be used in rituals to advance the wealth of clients in Tanzania and Malawi, Mr Caetano said, citing the suspects. There has been a spate of killings of people with albinism in East Africa in recent years, with their body parts used to make charms and potions by witchdoctors.